TORONTO (June 14, 2001) -- Jim Gregory, Chairman of the Hockey Hall of Fame Selection Committee, announced today that former NHL greats, Viacheslav Fetisov, Mike Gartner, Dale Hawerchuk and Jari Kurri have been elected to the Hockey Hall of Fame in the Player Category. The vote was made today at the annual meeting of the Selection Committee in Toronto. "The Hockey Hall of Fame is proud to welcome Slava, Mike, Dale and Jari as Honoured Members," said Jim Gregory. "Their contributions to the game of hockey are well documented and their election to the Hall of Fame is richly deserved." Viacheslav Fetisov anchored the Soviet Union's dominant National Ice Hockey Program for nearly two decades. The defenceman started his professional career in 1975 with CSKA Moscow in the Soviet League, and led his team to 12 consecutive League Championships. Fetisov also distinguished himself on the International stage, capturing 11 World Championship titles and three Olympic medals (Fetisov was named best defenceman in five World Championship tournaments). Fetisov joined the New Jersey Devils in 1989, then went on to capture two Stanley Cups with the Detroit Red Wings (1997 & 1998) before retiring following the 1997-98 season. 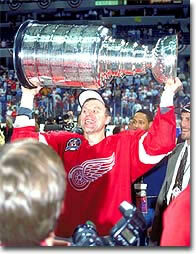 "This is unbelievable and the best day of my life," said Fetisov. "This is a wonderful recognition and as a player something I have worked for all of my life." Mike Gartner began a long and productive NHL career with the WHA's Cincinnati Stingers in 1978, where the fast skating winger finished as runner-up to Wayne Gretzky as Rookie-of-the-Year. 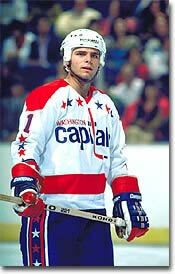 Gartner went on to play 18 seasons in the NHL for the Washington Capitals, Minnesota North Stars, New York Rangers, Toronto Maple Leafs and Phoenix Coyotes (1,335 total career points). During his distinguished career Gartner set NHL records by recording an astonishing 15 consecutive (17 total) 30+ goal seasons. "Getting the telephone call from Jim Gregory, a person who I have known for the past 25 years, was particularly gratifying," said Gartner. "I strove for consistency in all aspects of my life and am proud to be recognized over my career as being a player that produced for both my teammates and our fans." Dale Hawerchuk was drafted 1st overall by the Winnipeg Jets in the 1981 Entry Draft, and quickly made an impact on the team and city. 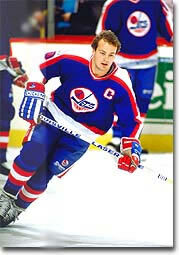 In nine seasons Hawerchuk broke 17 club records, captured the Calder Trophy as NHL Rookie-of-the-Year, and became the youngest player in NHL history to record 100 points in a season. The five-time All Star went on to play with the Buffalo Sabres, St. Louis Blues and Philadelphia Flyers before retiring following the 1996-97 season with 1,409 career points. "I have nothing but thanks for everything the game has given to me," said Hawerchuk. "I was able to live my dream for 16 years and played to be the best that I could be and I am grateful to be recognized as one of the best players from my time." 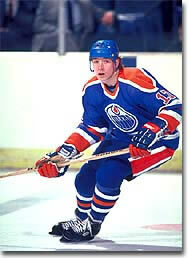 Jari Kurri, the highest-scoring European-born player in NHL history, played three seasons in the Finnish Elite League before becoming an integral part of the Edmonton Oilers dynasty of the 1980s. In his ten seasons with the Oilers Kurri recorded four consecutive 50+ goal seasons, five consecutive 100+ point seasons, and won five Stanley Cup Championships. Jari went on to play for the Los Angeles Kings, New York Rangers, Mighty Ducks of Anaheim and Colorado Avalanche before retiring in 1998 with 1,398 career points. Kurri, who becomes the first Finnish player elected to the Hockey Hall of Fame, represented his country at several World Championship tournaments and Winter Olympic Games. "It is a great honour since so few players are able to make it to this level," said Kurri. "To be the first Finnish player elected is especially gratifying." In the Builder Category, Craig Patrick was elected in recognition of his outstanding contributions to hockey. Patrick helped build the U.S. National and Olympic hockey programs, capturing a Gold Medal at the 1980 Winter Olympics as Assistant GM/Assistant Coach of Team U.S.A. Patrick, who went on to coaching and management roles with the New York Rangers and Pittsburgh Penguins, was named a member of the United States Hockey Hall of Fame in 1996. The 2001 Induction Celebration will be held on Monday, November 12th at the Hockey Hall of Fame in Toronto. For more information regarding the 2001 Induction Weekend/Celebration, stay tuned to hhof.com. On March 27, 2001, Bill Hay, Chairman of the Hockey Hall of Fame, announced that the Board of Directors appointed two new members to join the Hockey Hall of Fame Selection Committee beginning April 1, 2001. Long time New York Islander coach Al Arbour and NHL broadcaster Mike Emrick replace former Selection Committee members Bobby Orr and the late Jim Proudfoot. 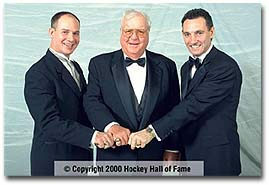 "The Hockey Hall of Fame owes a great debt to both Jim and Bobby for their service on the Selection Committee," said Hay. "We are fortunate that Al and Mike - hockey men of great integrity and knowledge  have agreed to serve the Committee in their place." Al Arbour is one of the most successful coaches in NHL history. His guidance contributed significantly to the New York Islanders' run of four consecutive Stanley Cups from 1980 to 1983. Mike Emrick has 20 years of NHL play-by-play experience, and is in his tenth season as the voice of the New Jersey Devils. He received the EMMY award for the New York region in 1997. The annual meeting of the Selection Committee will be held in Toronto on June 14, 2001 to select and announce this year's inductees. This fall's Induction Weekend festivities will take place November 9-11th culminating with the Induction Celebration on Monday, November 12th. The Hockey Hall of Fame Selection Committee consists of 18 individuals appointed by the Board of Directors, whose mandate is to nominate and elect candidates as Honoured Members in the Player, Builder and Referee/Linesman categories. Player and Referee/Linesman candidates must have concluded their respective playing or officiating careers for a minimum of three playing seasons. First year eligible players are those that retired after the 1997-98 season.